Shapes and Measure 1 – let us divide! This is a part of Thousand Flowers Pre-Olympiad lectures at Cheenta. 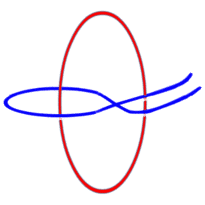 It is an experiment to teach percentage arithmetic, euclidean geometry, rational and irrationals and computational software tools in an interdisciplinary manner. We extensively used GeoGebra and plan to use Python later in this sequence of discussion. The exposition is conversational (in the spirit of Tarasov’s Pre-Calculus). As a method of pedagogy, dialectics is subtly employed to enhance student’s grasp of the subject. Teacher: Cent is a French word. It means 100. “Percentage” essentially means: divide the whole quantity into 100 parts. Student: But why should we do it in the first place? compare portions with the whole. measure large (or small) pieces in terms of the whole. The key idea is, we have to fix the whole first. S: What is the whole? T: It depends on the context. For example, the whole could be the monthly salary of a person. Suppose monthly salary of Mr. Bakshi is Rs. 20,000. Then that is the whole quantity. If he wants to buy a mobile phone worth Rs. 12,000, he may want to know, what portion of the salary is being spent on this single purchase. So he divides whole quantity (Rs. 20,000) into 100 parts. Each part is Rs. 200. Rs. 12,000 is made up of 60 such parts. ( \(60 \times 200 = 12,000 \) ). Clearly, he is spending 60 out of 100 parts on this purchase and we say it is 60% of the income. S: I see. So we wish to compare the partial expense with the total money available. Problem: Consider the cricket career of Sachin Tendulkar. Find from the internet, the number one-day matches that he played. Next, find the number of matches he has scored 50 or more. If whole quantity = the total number of matches = 100 parts, then in how many parts he scored fifty or more. S: What is the other use? How can we measure by dividing the whole into 100 parts? T: In order to do this, you have to first fix a reference length. It could be any length (there is no need to use a ‘ruler’; in fact, we will be building a ruler). Take any length and declare that length as the whole quantity = 100 units. Suppose AB is that length. As an example, consider the following picture. Remember that we declared the length of AB to be 100. Can you estimate the length of XY from this picture? S: I cannot say exactly. It seems to me, that XY is more than 300 but definitely less than 400. T: Excellent. We could ‘cut’ three times with the length of AB. And there is some more. How do you think we can measure this remaining portion after the third cut? S: Taking a cue from what you said earlier, we can divide the whole (=AB) into 100 parts, and try to fit in as many parts as possible in the remaining portion. T: Precisely! Suppose we can fit in 72 of these 100 parts in the remaining portion after the third cut. But even after that, some tiny portion remains excess. What should we do? S: Ah! I am out of my wits. What can be done here? T: Well, we may further divide the hundredth part of AB into 100 parts. Now, each tiny part is 1/10000th part of AB. We will try to fit in as many of these super tiny lengths into the excess portion as possible. S: I see. Since these pieces are super thin, we will be able to fit in several pieces of this in the excess portion. S: But will that cover that excess portion entirely? T: This is an excellent question. If it does not, we will have to divide 1/10000 th part of AB into 100 parts again and try one more. But there is no guarantee, that if we keep of doing this, we will be able to exactly fill in the entire length of XY (with no super little part remaining uncovered). In fact, one of the key discoveries of the ancient Greeks was to find such a length, which can never be exactly covered by these pieces (no matter how many times we split them into hundred parts and try to fill up the excess portion). S: Wow! I wonder, what length will that be. T: Actually there are many such lengths. Create a right triangle, with the length of legs = AB. Then the hypotenuse is one such length. Of course, we will need to prove this claim. We will come back to this idea. But even before doing all these, we have to resolve one issue: how to split AB into a hundred equal parts. In fact, let’s handle a much simpler problem: how to split AB into two equal parts (using a compass and an unmarked straight edge).